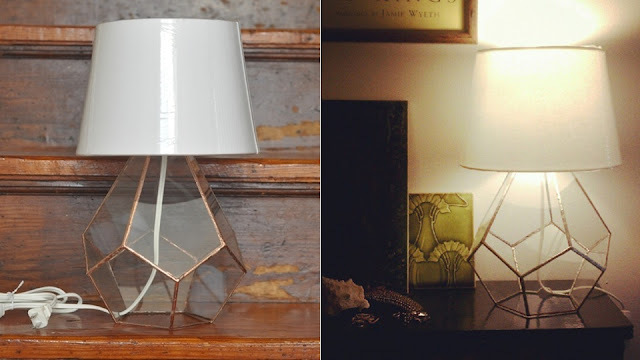 Ashley Bram-Johnson of ABJ Glass has a new geodesic prism lamp available, which I spotted on Gizmodo. While at first glance it looks like a terrarium-worthy vessel, it seems that a hole for the lamp cord is unfortunately placed near the bottom of the base of the prism. It seems that soil and water would run out of the hole unless you could build some sort of shield around it. Maybe a good option for a faux terrarium with fake plants! I actually made a lamp terrarium and the cord went through the bottom similar to this one. I didn't have any problems with leakage, however. Thanks for sharing, Kristen! Your terrarium lamp is beautiful! Do you have any problems with the plants getting too warm when the lightbulb is switched on? If you have a hole in the bottom I'd just use a bit of shower silicone caulk you can find at Lowes or Home Depot to plug it.